This week’s release of the Congressional Budget Office (CBO) report on the minimum wage has generated a good amount of discussion about the potential impacts of a minimum-wage hike. Not immediately apparent from these discussions – as this CEPR post points out – is the fact that, on the whole, the report shows that on almost every issue, the report sides with supporters of an increase. 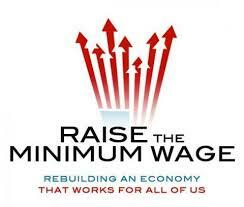 – Raising the minimum wage would benefit many American families. The CBO estimates that about 16.5 million workers would receive a wage increase, and that about 8 million additional workers would be indirectly impacted as employers adjust internal pay scales. These numbers are consistent with EPI’s estimate in this report, which also breaks down the impact by state (about 735,000 NC workers would be directly affected and over 1 million would see a raise). – Most minimum wage workers are older than you think. The CBO concludes that only 12 percent of low-wage workers who would receive a wage increase are teenagers. Proponents of minimum wage hikes have long worked to dispel the myth that the majority of minimum-wage workers are suburban teenagers working for spending money. In fact, close to a third of America’s minimum wage workers are over 40 and in North Carolina, 82 percent are 20 or older. – The minimum wage can act as a stimulus to the broader economy. The CBO report acknowledges that low-income earners tend to spend a larger proportion of their earnings than the average consumer, thus providing a stimulus effect. Our report citing EPI data shows that the estimated GDP impact on North Carolina of a minimum wage increase to $10.10 would be approximately $1.3 billion. The following post was written by Stan C. Kimer – Immediate Past President of the NC Council of Churches – in response to an op-ed claiming that North Carolina’s unemployment insurance cuts have led to more employed Tar Heels. Two weeks ago there was an op-ed by Brian Balfour claiming that cutting unemployment benefits has led to more employed North Carolinians. This was followed up by an article on the front page of Sunday’s N&O presenting that much of the decline in unemployment may instead be due to discouraged people simply dropping out of the workforce. As the Immediate Past President of the North Carolina Council of Churches, with membership across 17 denominations and many churches statewide, how should people of faith respond to chronic unemployment? Christian scripture speaks of uplifting and encouraging others, being our brother’s keeper, helping those in need. As a person of faith, I believe that cutting off assistance when families need it the most is the proverbial “kicking a person when they are already down on the ground hurting.” This is opposite of the Good Samaritan who instead found a man hurt and bleeding on the side of the road and offered assistance. Providing needed assistance is truly a form of encouragement. By providing fair unemployment benefits, those without a job can have some of the financial pressures relieved, gain a modicum of self-respect and inspiration, and have more energy to find employment. What would a minimum wage raise mean for North Carolina? A family with two kids that earns the minimum wage still lives below the poverty line. That’s wrong, Tonight, let’s declare that in the wealthiest nation on Earth, no one who works full time should have to live in poverty, and raise the federal minimum wage to $9 an hour. It could mean the difference between groceries or the food bank; rent or eviction; scraping by or finally getting ahead. For businesses across the country, it would mean customers with more money in their pockets. As we’ve written before, a raise in the federal minimum wage to $9 per hour would not only affect almost 700,000 low-wage workers in North Carolina, it would have a potential positive GDP impact of $495 million. North Carolina’s minimum wage tracks the federal standard of $7.25 per hour, which means that a full-time minimum wage worker earns roughly $15,080 per year. A conservative measure of actual family costs for one adult and one child in North Carolina requires an income of more than twice this amount. And the price of food, gas and utilities has steadily climbed while the value of the minimum wage has not. In North Carolina, as in the rest of the country, the majority of minimum wage workers are adults, many of whom are supporting families. And minimum wage workers are disproportionately women. As this infographic from the National Women’s Law Center demonstrates, women have about a 4 percent chance of becoming the CEO of a Fortune 500 company, yet have a more than 60 percent chance of being a minimum wage worker. A recent letter signed by close to 600 economists called on our nation’s leaders to raise the minimum wage, reemphasizing that doing so is good economic policy. And a robust body of research has looked at employment levels before and after minimum wage increases in states, counties, and metropolitan areas and has shown that raises in the minimum wage failed to lead to job losses, even during times of high unemployment. It’s pretty straightforward: jobs that don’t pay enough to pay the bills, can’t sustain the economy. Take a look at this 1.5 minute video from the Topos Partnership – it’s a great illustration of how adequate job compensation builds thriving communities. 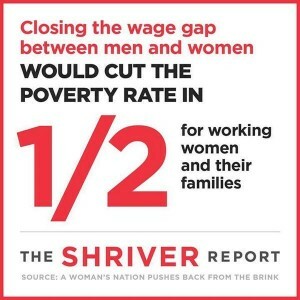 The new Shriver Report: A Woman’s Nation Pushes Back from the Brink takes a closer look at the economic reality and economic contributions of women in America. At a time when women are two-thirds of families’ breadwinners or co-breadwinners, one in three American women continue to live on the brink of poverty (defined here as 200 percent of the federal poverty line) or one lost job, medical emergency, or a broken-down car away from it. The statistics don’t look any rosier for women in North Carolina. Almost four of ten women in North Carolina live under 200 percent of the federal poverty level and that percentage goes up for women of color. Women in North Carolina continue to make 82 cents on the dollar (or 49 cents on the dollar for Hispanic women). Rising poverty: What does UI have to do with it? Over the last decade, poverty in our state has been on the rise. UNC Economics Professor Patrick Conway, in his new paper Poverty in North Carolina since 2000, explains that “poverty in North Carolina until 2000 had been a chronic but declining disease,” a trend that has been cruelly reversed. In the face of this disturbing trend, Conway examines the links between unemployment and poverty, with an important emphasis on the role of unemployment insurance. The general link between unemployment and poverty is straightforward: conditioning on other factors, those without jobs are more likely to have income falling below the poverty threshold than those with jobs. Those without jobs, however, can be divided into two groups – those who qualify for unemployment compensation and those who do not. Unemployment compensation provides a support that will lift a portion of those receiving it once again above the poverty line. It’s a timely message, given the lack of action to renew federal Emergency Unemployment Compensation (EUC), ensuring that long-term unemployed workers in 49 states will lose benefits just in time for the holidays. Of course, long-term unemployed workers in North Carolina have first-hand experience simply by living in the one state that has been ineligible for EUC for the last four months. Thanks to HB4, which reduced the number of weeks and the amount of state benefits for jobless workers, North Carolina’s long-term unemployed residents also lost access to the federally-funded EUC program. Where have these cuts taken us? North Carolina is still lagging the nation in job creation and unemployment and even the conservative think tank the American Enterprise Institute is questioning the cuts made to NC’s UI program.